your users have been looking for. Transform your 5250 green screens in minutes and take advantage of decades of code and years of information. Create spectacular web and mobile-ready applications with ease and show the value of your IBM i. Green screen modernization has never been so easy! When considering modernization, a screen-by-screen approach can seem like the “quick and simple” fix; but when you have to build quality UIs for many hundreds of screens and then maintain and update them, you realize this approach can mean a lot more work. Newlook’s dynamic recognition engine makes modernization simple and effective, allowing you to perform structural changes to your application and still get great UIs effortlessly. This is the smart way to modernize for sustainable maintainability and to build for your future. We all love the IBM i. For many of us, however, it’s often not the only platform we have to work with. Newlook integrates and extends your IBM i applications to work seamlessly with other platforms, such as web, desktop, mobile, Windows, Unix and Mainframe. Working in a single development environment makes it easier to manage and enhance your applications, providing predictable, high-quality results every time. With a single development effort, you can deploy smart and thin clients allowing you to take advantage of all the rich features you use in your 5250 screens today. While browsers offer the dream of zero client installations, they don’t always support all IBM i emulator functionalities. When modernizing to web, users may require speed, keyboard buffering and type ahead to remain as productive as they were on the IBM i. 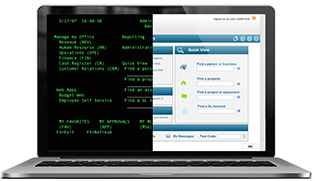 With tight desktop integration, strong keyboard compatibility and the power to have multiple sessions talk to each other, Newlook Smartclient is the best option for emulator replacement with business users. Newlook delivers a modern user interface that looks great across all browsers and respects emerging web standards such as HTML5 and CSS3. the one we got with Newlook, whether it's a web application or a windows user interface, you can re- use the business logic. RPG programmers can enhance IBM i applications and write new ones for web devices more naturally. Total UI control. Intelligent rulers, smart guides and in-place editing allow the best WYSIWYG UI design. Intuitive design environment with common tasks automated, saving you time and money. Single-click browser preview to allow instant testing of your solution with any browser.